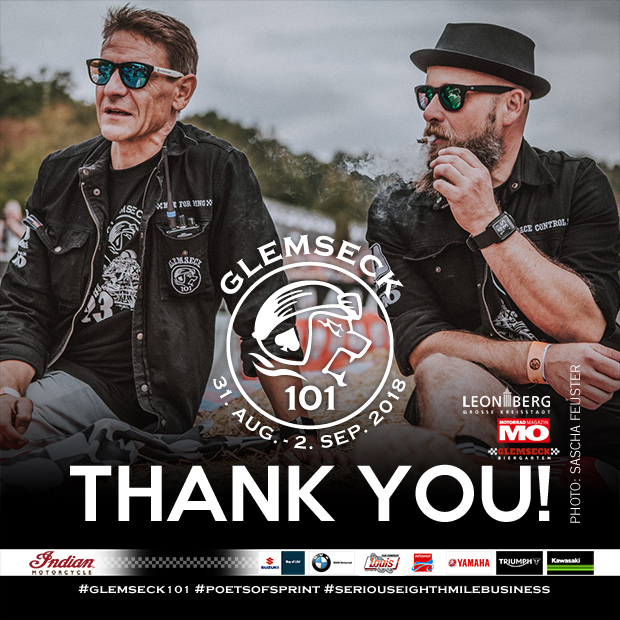 Dear friends, fans, visitors, sponsors and guests of the Glemseck 101 – Round 13. 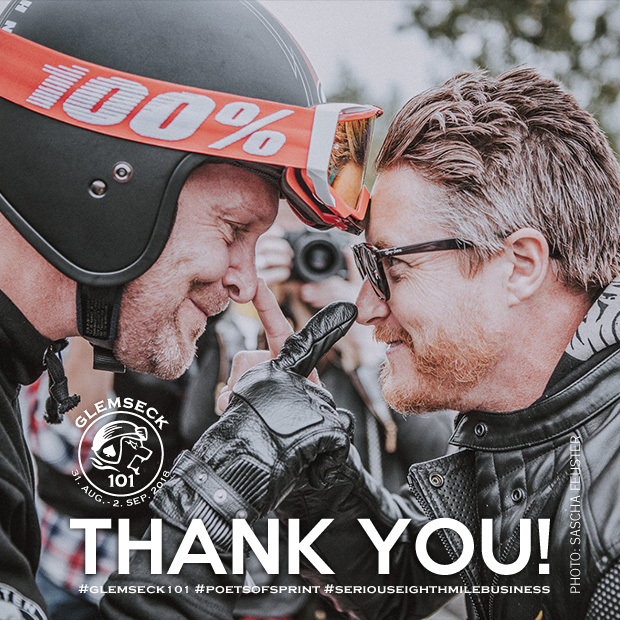 You all deserve the honor that our Glemseck 101 was again a great success, although the weather really challenged us in Round 13! Friday it rained almost the whole day. And maybe that’s why our 101 was like a very, very big family reunion of all the characters in the motorcycle scene. Everywhere, not only on our 101 stage played music and in almost every booth there was laughing, discussion (number one about the weather) and story telling. Too, a large number of visitors found their way to us in the still slightly rainy evening hours and enjoyed this very special “101 Spirit”. Thank you! Saturday then, Glemseck 101 pure. The 1/8 mile remained dry and great fights and dramas took place on the track. Contestants such as 5-time GP World Champion Mick Doohan (Honda Motorcycle), designer legend Roland Sands (Indian Motorcycle), racing legend Andy Hofmann (Team Motorrad Senger), stunt girl Mai-Lin Senf (LOUIS) and Glemseck 101 audience favorite Nate Kern (BMW Motorrad) battled hard on the 1/8 mile. Favorites went down, 101 rookies were fighting for the podium. The campsite, parking lots and paddock were filled to the brim. The 101 area looked since early morning like a peaceful but wildly humming hive, and the music and party played late into the night. Whether at the 101 stage, at the Sultans of Sprint or in one the many booth of our guests and contestants from all over the world. Thank you! Sunday then, it hit us wet and hard. Everyone woke up with him: the rain. Pouring lightly but consistent. 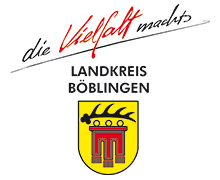 Nevertheless it was possible for the AMSC Leonberg and the Race Control Team of our Media Partner Motorrad Magazin MO – also thanks to the great work of the many helpers of the City of Leonberg – to get the 1/8 mile dry for one whole hour. 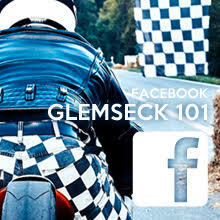 Thus, in our Round 13, the daily statistics of the Glemseck 101 remains “clean”: there is no day in our 1/8 mile history, where we were not able to send motorcycles into the 1/8 mile. In 2018, the eight participants in the BMW-4Valve-Boxer-Sprint were the lucky ones to race for their family crown. 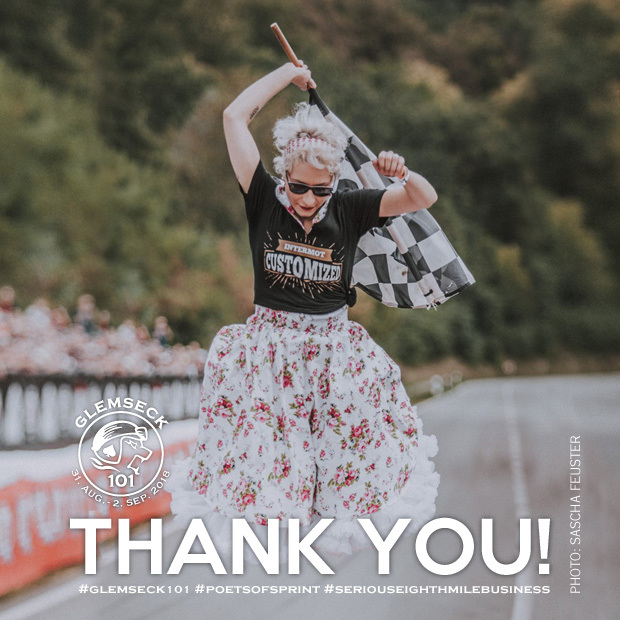 A special thanks to Jens Speckmaier (CSM-Racing) and Sepp Frauenschuh (Team Berreiter), who were the first to line up in the following Sprint International Part 2. They came back from their test run and both indicated: No way – too dangerous! 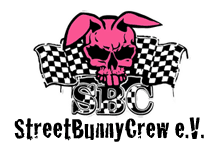 Both are experienced 1/8 mile contestants and Full-Blood-Circuit Racer, so their opinion counted 100 percent – and our race control then broke off the competition. Which did not spoil the vibes among the visitors of the Glemseck 101! Honestly, we as Team 101 were surprised how many of you, despite rain, found their way to the Glemseck 101 – and so probably have pronounced to us the greatest praise! Thank you! A few short scenes of how close joy and sorrow lied beside on the 1/8 mile in Round 13. 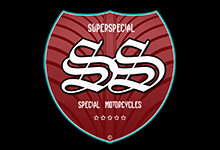 My own euphoria and the wild heartbeat crossing the finish line when, after years, I had the chance to ride out a 1/8 mile sprint myself again. With the Husqvarna Vitpilen 701 provided by Limbächer & Limbächer in the INTERMOT vs Team Glemseck 101 Showrun against their Yamaha XV 950 R, which I could defeat. The final scene in the Sultans of Sprints “Freak class”. Winner Danielle Ghiselli – South Garage Cafe Italy / Milan – had just shown a jump start in their final and according to the regulations the sprint had to be repeated. While the restart of the final sprint was being prepared, Giuseppe Carucci jumped up and down in front of the front wheel of his much older rider, screaming and dancing like a dervish. Maybe we will never know what all the Italian swearwords(?) he was throwing at Danielle’s helmet meant (Stay calm!!! No more pasta for you!!!) – but it was an unforgettable scene full of racers passion! Andi Neuhold with his great and very extreme “The Rocketeer”, who simply did not want to start again after her test run. His tortured, almost bewildered look under his helmet burned you. And for myself, the personally biggest drama: “Danny” MacPherson on his very radical NORZUKI. In one go and through the night from England coming to attend the Sprint International for the first time on Sunday. Daniel was 3 meters(!) in front of the start line as Race Control had to stop the race. So close, Danny, so f*** close! Passion, euphoria, sometimes disbelief and very often devotedness. All this is the Glemseck 101. Not because we as Team 101 plan it, but because you as visitors, guests, contestants and sponsors bring those to us. 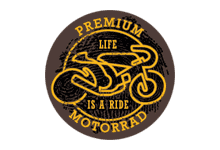 Whether 1/8 mile, race track or road: Motorcycling is life and life is never perfection. As well as, with all its risks? Doing something new, like our TV1.eu live stream. To improve, as the varied measures on the 1/8 mile. And with what we all meet on two wheels: the weather. What we make of this for ourselves, how we see and experience it, and what story we have then to tell – is up to each one of us ourselves. 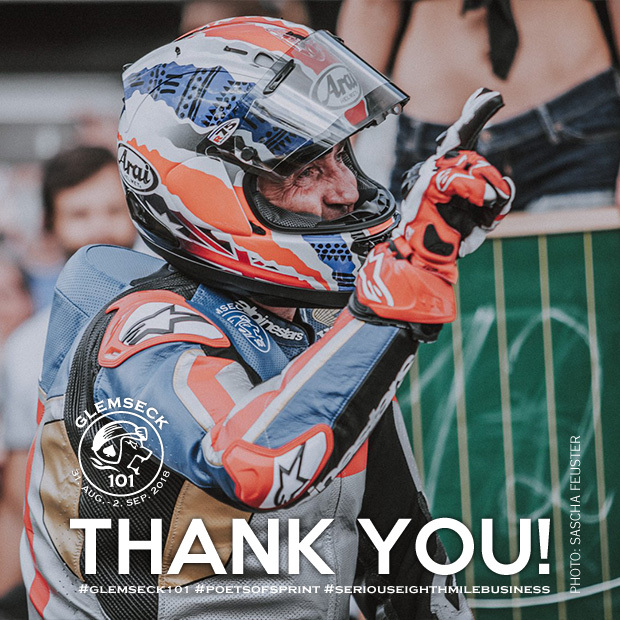 Me and the entire Team of Glemseck 101, the Race Crew of the Motorrad Magazin MO and the AMSC Leonberg, the helpers and supporters of the City of Leonberg and all our sponsors – we hope you have a great story to tell about us and our Round 13! And we look forward to the first weekend of September in 2019. 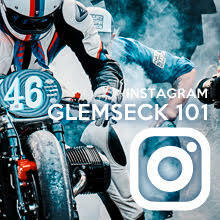 And we’ll be happy if you follow and share us on Facebook and Instagram – and use the hashtags #glemseck101 and #2018glemseck101 to inform about your own 101 experience and see what was and will come.